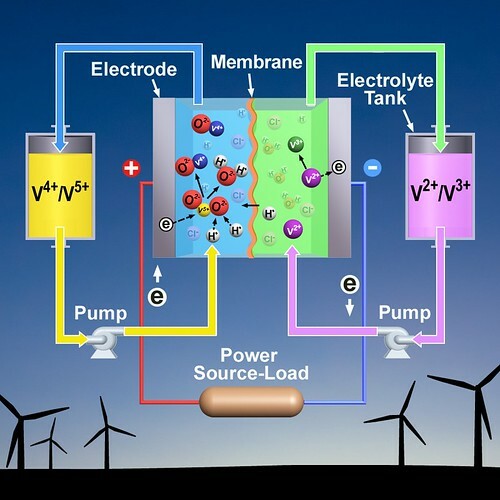 This artist's rendering of an upgraded vanadium redox battery shows how using both hydrochloric and sulfuric acids in the electrolyte significantly improves the battery's performance and could also improve the electric grid's reliability and help connect more wind turbines and solar panels to the grid. RICHLAND, Wash. — Though considered a promising large-scale energy storage device, the vanadium redox battery's use has been limited by its inability to work well in a wide range of temperatures and its high cost. But new research indicates that modifying the battery's electrolyte solution significantly improves its performance. So much so that the upgraded battery could improve the electric grid's reliability and help connect more wind turbines and solar panels to the grid. Unlike traditional power, which is generated in a reliable, consistent stream of electricity by controlling how much coal is burned or water is sent through dam turbines, renewable power production depends on uncontrollable natural phenomena such as sunshine and wind. Storing electricity can help smooth out the intermittency of renewable power while also improving the reliability of the electric grid that transmits it. Vanadium batteries can hold on to renewable power until people turn on their lights and run their dishwashers. Other benefits of vanadium batteries include high efficiency and the ability to quickly generate power when it's needed as well as sit idle for long periods of time without losing storage capacity.